CHRISTIANELLA W. R. Anderson, Novon 16: 190. 2006.—Type: C. mesoamericana (W. R. Anderson) W. R. Anderson. Woody vines, or shrubby in open habitats; stipules very small, triangular, borne on petiole near base; petiole eglandular or bearing 2–10 large to small glands in 2 rows; lamina eglandular or bearing several small sessile glands on margin on proximal half. Inflorescences terminal or lateral, single or (usually) grouped in panicles, with flowers decussate to irregularly inserted in short to elongated pseudoracemes; bracts and bracteoles eglandular or bearing several subsessile to long-stalked, clavate or capitate marginal glands; floriferous peduncle well-developed; bracteoles borne at apex of peduncle. Sepals elongated but separating to expose petals during enlargement of bud, appressed to spreading in anthesis, the lateral 4 bearing large paired abaxial glands, all 5 bearing a row of small sessile or subsessile to long-stalked, clavate or capitate marginal glands; corolla bilaterally symmetrical, the posterior petal with a longer and thicker claw than the lateral 4; petals yellow, abaxially densely tomentose, adaxially glabrous; androecium bilaterally symmetrical; stamens glabrous; filaments connate at base, straight, strongly heteromorphic, longest and much thickened opposite the 2 posterior-lateral petals, usually long but slender opposite the anterior sepal, shortest opposite the posterior petal; anthers subequal or larger on stouter filaments; gynoecium bilaterally symmetrical; ovary with the carpels very shortly connate; anterior style straight and shorter than the others, the posterior 2 straight or bowed from the base; apex of styles dorsally truncate to short-hooked, the stigma internal. Samaras separating from a short obscure pyramidal torus; samara suborbicular to butterfly-shaped, the lateral wings membranous with reticulate-anastomosing venation, cleft to nut at apex, continuous at base or cleft to nut, bearing stiff, usually basifixed or sub-basifixed hairs mostly inserted at dark spots, the margin undulate or coarsely dentate; dorsal wing extended forward at apex through gap in lateral wing, distinct at base or confluent with lateral wing; intermediate winglets mostly lacking, rarely 1, narrow; ventral areole circular or broadly ovate. Chromosome number unknown. Five species in southeastern Mexico, Central America, and South America, in forests, roadside thickets, and shrubby savannas. [map] — Regional key to genera: Central America. Christianella is distinguished by the small glands found on the margin of the sepals, and in most species on the margins of the bracteoles and sometimes the bracts. Such marginal glands are found in a few other Malpighiaceae (e.g., Blepharandra fimbriata MacBryde), but not in any other genus with mascagnioid samaras. 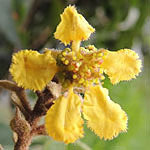 This group of species is also notable for the marginal leaf glands, the yellow abaxially tomentose petals, the heteromorphic filaments, and the membranous samaras. The stiff hairs on the samara wings are usually inserted at characteristic dark spots. Two of the five species (C. multiglandulosa and C. surinamensis) are included in the latest sampling of DNA sequences (Davis & Anderson, 2010 [pdf]), and the bootstrap support for the genus is 100%. Reference: W. R. Anderson (2006b, pp. 190–192), partial revision: description of genus, key to species, nomenclature of species, but no descriptions of species (Christianella only: pdf; entire paper: pdf); unpublished notes on species of Christianella. Etymology: The name Christianella honors the American botanist Christiane Eva Seidenschnur Anderson (b. 1944).